Sometimes tragedies do bring out the better angels of our nature. And they bring together new allies in common cause to help those who are always at the forefront of relieving human suffering. Much money has been raised for Haitian relief. World leaders meet at conferences to discuss reconstruction. Great concerts are held. All this is just and right. But sometimes we forget that there are things to do right here at home. Sid Stevens and his Sun Youth organization have never forgotten that. When Haitian survivors and orphans began arriving at Trudeau Airport he leapt into action. Sun Youth has had a round-the-clock staff of 25 volunteers at Trudeau International Airport since the earthquake hit, working five shifts a day, seven days a week, to welcome and process Haitians returning on Canadian passports. Sun Youth is working in partnership with the Red Cross and the Quebec Protection Agency, and has already provided emergency help to the more than 2,000 Haitians who have arrived. Some 6,000 more are still expected. When Montreal lawyer and activist Brigitte Garceau heard about this plight she brought her Garceau Foundation into partnership once again with Suburban editor Beryl Wajsman’s Institute for Public Affairs. As Suburban readers will remember, that was the team that put together the highly successful “Cassandra’s Lilacs” anti-poverty concert at Theatre St. Denis. They launched a fundraising campaign for the benefit of Sun Youth with a blitz this past weekend and already delivered the first cheque. And they did it with an interesting new ally, the Consulate-General of the Dominican Republic. The DR’s involvement really highlights a story of three societies and an island. Quebec has, of course, close cultural ties with Haiti with Montreal being home to one of the largest Haitian diaspora communities. The Dominican Republic, which shares the island with Haiti, is one of Quebecers’ favourite vacation resorts. So the ties between Quebec, Haiti and the DR are intimate. But the DR’s story of assistance to its Haitian neighbour has not really been told. Institute board member, Montreal businessman Stavros Daskos, brought the story to Garceau and Wajsman’s attention. Daskos himself, as was reported in these pages last week, has been sending tents and cots to Haiti through the DR since soon after the tragedy struck. He brought the activists and the diplomats together. The Dominican Republic’s Consul-General Raquel Jacobo and Vice-Consul Frank Cabral very much wanted to do something here, on the ground, to reflect to Quebecers the DR’s continuing commitment to Haitian relief that was going on at home. 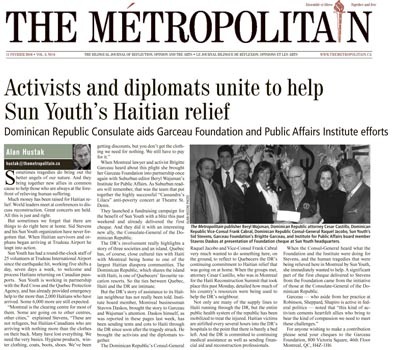 When the groups met, attorney Cesar Castillo, who was in Montreal for the Haiti Reconstruction Summit that took place this past Monday, detailed how much of his country’s resources were being used to help the DR’s neighbour. Not only are many of the supply lines to Haiti running through the DR, but the entire public health system of the republic has been mobilized to treat the injured. Haitian victims are airlifted every several hours into the DR’s hospitals to the point that there is barely a bed left. And the DR is committed to continuing medical assistance as well as sending financial aid and reconstruction professionals. When the Consul-General heard what the Foundation and the Institute were doing for Stevens, and the human tragedies that were being relieved here in Montreal by Sun Youth, she immediately wanted to help. A significant part of the first cheque delivered to Stevens from the Foundation came from the initiative of those at the Consulate-General of the Dominican Republic.